Naty by Nature Babycare Eco Pull on Pants allows your growing toddler to move around freely with the leak protection you expect from Naty. Naturally breathable, chloring and fragrance free pull ups for toilet training and night time betwetting. Made from GM free corn based film and natural, renewable materials. 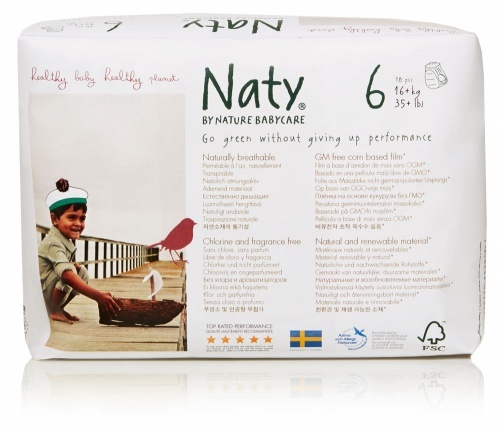 Nature Babycare nappies and nappy pants mean you can go green without giving up performance! Nature Babycare Nappies & Nappy Pants are award winning high performance biodegradable nappies & nappy pants based on natural, plant-based materials for your baby's wellbeing. The best thing is all NAture Babycare products are totally chlorine free, contain no perfume, dyes or parabens and the baby wipes even come in eco packaging: biodegradable maize! Another high point, the wood pulp used is from sustainably managed Scandinavian forests. Go green without giving up performance! Nature Babycare is the result of many years of intensive work and development. 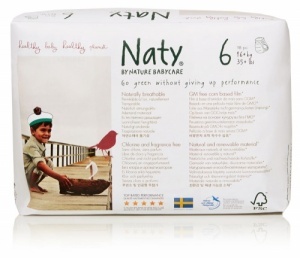 The first Eco-friendly nappy based on new green technology, protected by a Swedish patent. Soft, thin, comfortable and with perfect sizing. With an exclusive chlorine free material. With corn based compostable non pastic leakage barrier, distribution layer and outer packaging. And it performs as well as the best 'traditional' nappy. I've been using these nappies for nearly two years and have moved onto size 6. They are a great fit, no leaks. I love these nappies. Would recommend them to family and friends. Very happy with our purchase, working well, no leaks. Using them to help with night time training (backup).